Primary Activity: Cower under a rain shelter. The environment around Larsen Bay, located on the west side of Kodiak Island, has a number of very interesting hikes and explorations, and I always visit on my way over to the Alaska Peninsula for bear photography. 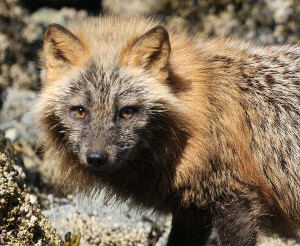 This doesn't mean there are no bears on Kodiak Island, quite the contrary — it's just easier and safer to photograph them in a place like Geographic Harbor, where I can anchor my boat off a beach where bears dig clams each low tide. This article covers several aspects of my Larsen Bay visit, the most important being the fact that a historic Venus transit across the sun took place while I was there, and I decided to set up a solar projector so the people in Larsen Bay could see this rare astronomical event. For reasons I won't try to explain, Venus transits come in pairs, separated by eight years, but the pairs of transits can be separated by more than 100 years. The last pair were in December 1874 and December 1882, and the next pair will be on December 11, 2117, and December 8, 2125. So it's fair to say Venus transits are very rare — much more rare than, for example, solar eclipses. Because of unfavorable weather and a lack of preparation I missed the last Venus transit in 2004 (the first event in the pair), but this time I wanted to be fully prepared in case the weather cooperated. As the date approached (June 5th) I began to think of a way to make a simple solar projector that I could set up in a public area in Larsen Bay and let local people see the event. To see Venus transit the sun, you want to get an image of the sun, but looking directly at the sun is very dangerous. There are a number of ways to safely view the sun. A pinhole in cardboard is a time-honored approach, but it's not very bright and the sun's image isn't very large — not really suitable for public viewing. A piece of dark welding glass is often mentioned, but this is an individual viewing method, also not suitable for a crowd. Early in the transit, which began about 15:00 (3 PM) local time, things were rather cloudy, and I worried that the transit might be clouded out. But as time passed, the clouds separated often enough so everyone got to see the big event. It was great fun — word quickly spread, and many people who might never have seen an astronomical event managed to see Venus passing in front of the sun. If you decide to set up a sun projector like this for an eclipse or another event, don't leave it unattended when there are children present, and warn people not to try to look directly through the optical system or directly at the sun. Also, binoculars are better for this activity than a larger-aperture telescope, because unless the telescope remains perfectly aligned, the sun's energy will cook the telescope eyepiece lenses, coatings and adhesives. I must mention that the above pictures were taken on June 6th, a perfectly clear day — the day after the Venus transit described above, which was almost clouded out. Not that I minded the clear weather on the day after the transit, it's just that Venus transits only happen about every 100 years. 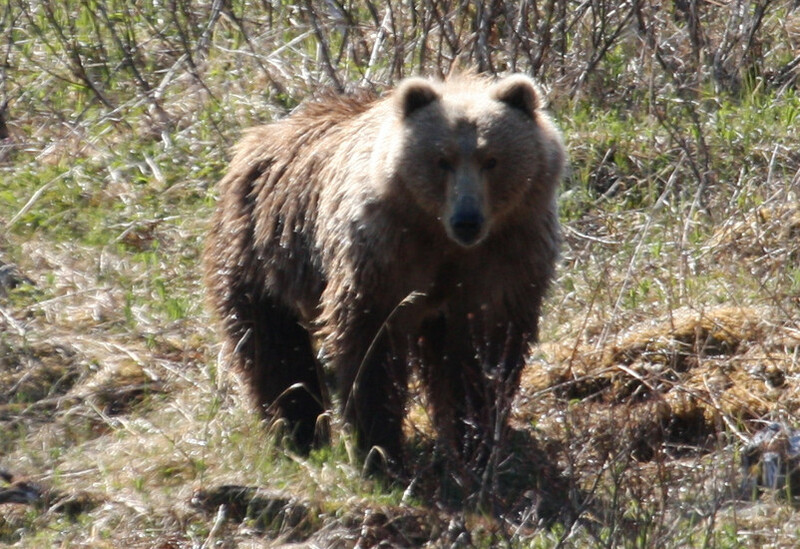 As I made my way back to Larsen Bay I encountered a bear alongside the trail. I emphasize this isn't my usual mode of bear photography, where I'm on a big boat, anchored well away from shore, using a telephoto lens. The picture below is taken with a normal lens, and I'm just hiking along, with a backpack and walking staff. I stopped and took the picture above. Then I decided to try out one of the textbook ways to make a bear leave you alone — which is to wave your arms and yell, "Go away, bear!" As I expected from past experience, this had precisely no effect. But once I put my camera away, put on my backpack and started hiking again — once I was in motion — he took off. This is also consistent with my past experience (bear-advice pamphlets tend to be long on anecdote and short on field experience). I emphasize that I've had any number of bear close encounters over about 35 years, and I've never seen any bear behavior that could remotely be called aggressive or threatening, including the day I accidentally stepped on a sleeping black bear in Oregon many years ago (he just got up and moved away). I always carry bear spray, but I've never had to use it. I've only ever seen reasonable bear behavior, sensible behavior that I wouldn't mind seeing in people. This isn't to say that bears don't attack people — they certainly do — but speaking statistically, I now have expectations for reasonable bear behavior that, based on long experience, I no longer have for people. Years ago, inexperienced in the ways of bears, I would remind myself never to turn my back on one. Now when I see a bear turn his back on a person, I reflect that he must be pretty inexperienced in the ways of people.